PCF- Mandela Enfin Libre - Et Maintenant des Elections Libres en Afrique du Sud! English Title: Mandela Free at Last- And Now for Free Elections in South Africa! 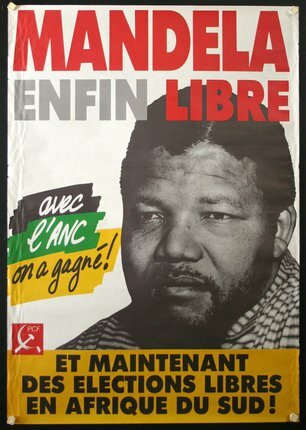 French poster celebrating the release of Nelson Mandela, the end of Apartheid, and the beginning of free elections in South Africa. Published in 1990 by the French Communist party. "With the ANC We Can Win!" Some crinkling on edges, would improve with linen backing.